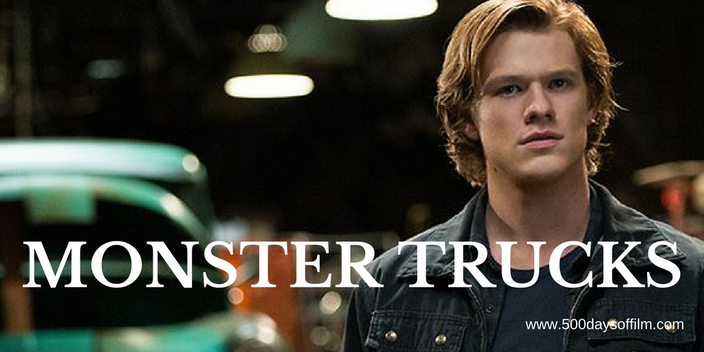 Looking to escape his small town life, teenager Tripp (Lucas Till) builds a Monster Truck from the parts of scrapped cars. When an accident at a nearby oil-drilling site displaces a strange and subterranean creature with a taste for oil and a talent for speed, Tripp discovers the escapism that he desires - all in the form of a most unlikely friend. Click Here For Weekly Reviews, News & Film Events! The idea behind director Chris Wedge’s new movie, Monster Trucks, is brain-numbingly simple. What would happen if there were actually monsters beneath the hoods of monster trucks? With a concept as brilliant as that, all that remained was to throw in some visual effects, add key elements from classic films such as ET, Iron Giant and How To Train Your Dragon and, ping, a new family movie was ready to roar off the production line. However, despite its silly, predictable and inconsistent plot, Monster Trucks is actually quite fun. Leads Lucas Till and Jane Levy are likeable and engaging (if criminally underdeveloped like much of the film’s human cast) and there is more than enough mindless action to keep little ones entertained (and adults awake). Thomas Lennon is good as conflicted scientist, Jim, and Creech the main monster is puppy-dog cute in a slimy, tentacled way. Don’t get me wrong, Monster Trucks is not a great film - older children may find its ridiculous plot tiresome and it cannot even begin to compete with ET and many of the classic family/creature movies of the past. Regardless, Monster Trucks passes the time and (particularly if you like trucks and monsters) you won’t mind its company. For maximum enjoyment, go in with low expectations and remember to put your brain in neutral. Have you seen Monster Trucks? If so, what did you think of this movie? Let me know by leaving me a comment in the box below.